Hi everyone! 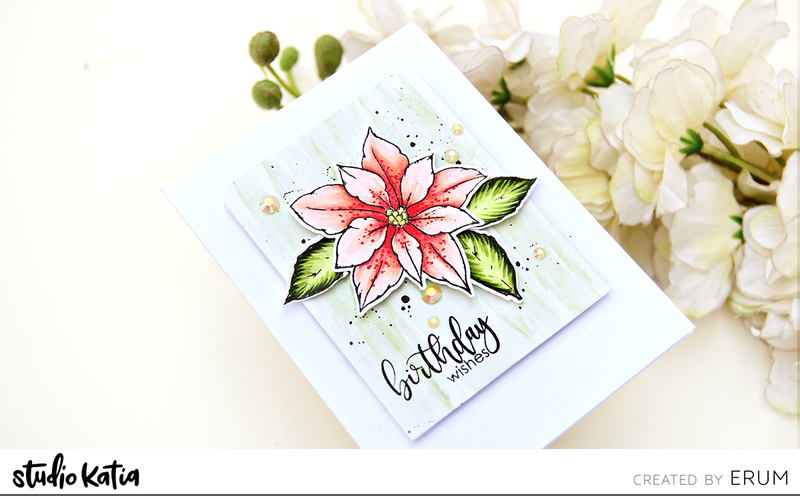 It’s Laura here and today I am back with a birthday card I created with the Cactus Hugs stamp set – there is also a video tutorial showing the card making process at the end of this post, I hope you’ll enjoy it! For today’s card I thought it would be fun to use one of the sentiments in the stamp set to create a background. Creating your own patterned paper is a really great way to stretch your supplies and, as today’s card shows, you can use not only images, but sayings too! So, as a first step, I die cut some Neenah Desert Storm cardstock with the Scallop Hearts Cover die. I then die cut an opening with one of the dies in the Scallop Square set and used Memento Dew Drops in Rich Cocoa to stamp the word hugs all over the panel. I set that aside and started working on my images. I stamped them with hybrid black ink on Neenah Solar White 110 lb cardstock and colored them with Spectrum Noir Markers. Once I was done coloring, I die cut them with the coordinating dies. I created a quick background for the window on my card using Distress Oxide in Broken China and the Ink smooshing technique. I then heat embossed the sentiment on a strip of black cardstock using white embossing powder. I glued everything to a white panel that I die cut with the Darling Ribbon & Frames dies and added a few sequins from the Majestic Fusion Mix. I mounted everything on a top-folding A2 card base and that finished off my card. As I mentioned at the beginning of this post, I uploaded a video showing how to create this quick birthday card with a custom background using the Cactus Hugs stamp set. You can watch it down below or directly on the Studio Katia channel! And that’s it for today! I really hope you liked the card and enjoyed the video! Thank you all so much for stopping by and have a great day! Happy Friday my “Jawsome” friends! Yah, I really can’t help it, I am going to be a bit punny with my card today. This Jawsome stamp set is filled with so many punnies perfect for so many occasions. But today I’m using it to share a fun birthday card I made for my little cousin. I’m kinda kicking myself because the shark on the surfboard is on a wobbler and I didn’t get a clip of it in action 🙁 So you will have to take my word for it it is SO Sharktastic, lol! To begin, I stamped out the sharks and the surfboard from the JAWSOME set. Colored them in with Copic markers and then die cut them with the JAWESOME coordinating dies. Next, I created the pieces for the background. On Bristol paper, I blended out the sun rays for the sky using the UNDERWATER SUN RAYS using mustard seed distress oxide ink, then die cut the panel with the dotted frame from the DOTTED PATTERNS SET 3 DIES. For the ocean background, I blended out salty ocean oxide ink onto Bristol paper and once a base of color was applied I added the waves in by blending out another layer of color using the BRUSH STROKE WAVES STENCIL. To add a little more interest to the water I spritzed the piece with some water drops and picked them up with a paper towel. I then die cut waves into the ocean by using the TRIMMINGS BORDERS CREATIVE DIE and then die cut the dotted bottom edge and the sides to line up with the Sun Rays panel using the same DOTTED PATTERNS SET 3 DIES. Now that all the pieces were done, I assembled the card onto a top folding A2 sized card front. I started by gluing on the sun rays piece first, and then the middle wave piece and lastly, the bottom wave popped up using foam tape. At this point, I stamped on the sentiment to the top of the card front using a stamp positioner. Finally, I glued the sharks as shown in the water, but for the shark on the right I first glued him to the surfboard (don’t look to closely or you will see that he is actually on the bottom of it, I was trying to cover up the bite mark from the board, haha) and then I attached the glued surfing shark to an action wobbler to add an interactive element for the recipient. I then finished the card by adding some clear CLEAR ROUND DROPS MIX. For a complete supply list of all the products, I used today stop over on my BLOG. Hi there! It’s Natalia here. Today I want to share with you my card using beautiful Studio Katia supplies from the latest release – potted plants and cactus hugs. First, I stamped the cute images from the Kobi Bearing Gifts, potted plants and cactus hugs. Colored with copic markers and die cutting them with coordinating dies. I made highlights using white and silver pen. Next, I cut our a frame our of white cardstock using frame die from LOOPS set. I blended some distress inks onto white piece of paper. I placed all the elements on the paper panel using double-sided tape and foam tape and heat embossed a sentiment from BIRTHDAY GREETINGS using silver embossing powder. I embellished the card with APRIL CRYSTALS, MAY CRYSTALS and MINT DREAM CRYSTALS. Hi everyone! It’s Galina. I made a fun Birthday card using adorable shark stamp set. I started with cutting a panel with a window in the center using DOTTED PATTERNS SET 3 die set and regular white cardstock. Next, I needed to decorate inner oval piece. I applied few shades of blue distress ink. With large paint brush and water I added some splashes to the background. Next, I stamped 4 shark images with black Memento ink, because I planned to color my images with Copic markers. I colored shark boys with natural gray colors and girls – with warm gray colors 🙂 Also, I used few stamps from under the sea set, it’s still one of my favorite underwater themed stamp sets ever. I used rock, coral and seaweed staps to create a fun underwater scene. I cut out images and adhere them onto colorful oval piece I made before. I add lot of details n my background using bubbles stamp, clear round crystals and tiny white dots I made with gel pen. At last, I stamped shark-tastik sentiment on the card panel and adhere all parts on the card base. For the delicate oval frame I used liquid glue from studio Katia, it has fine tip, so you can easily apply glue on tiny elements. Hello everyone! We are so happy to share more exciting news with you. We would like to introduce NEW very talented and creative Member of our fantastic Design Team – Isha Gupta! We are so happy to have her joining our Team we’d like to celebrate with a Giveaway! Leave a comment by April 6th, 2019 and you can win a $50 Gift Certificate to our online store. Winners will be announced on April 7th. Hello everyone! Isha Gupta here with you today, and I am super excited and thrilled to be here with my first post as a Studio Katia DT member. I’ve loved the products for some time now and it’s an honor to be working with them along with such a talented bunch of ladies. For my card, I decided to have some fun with the new release products. I started by creating my background panel. I die cut a white mat layer using the frame from the Scallop Hearts Cover. I then blended some distress inks onto it. Next, I used Grid stencil on this layer, secured it with washi tape and blended the same colors of ink. I flicked some water for added texture and removed the stencil. Next, I die cut out a circle from this panel, adhere the circle to the white card base, added some chunky Flowers Glitter and secured it with a bit bigger circle cut out of vellum. This creates a shaker without adding extra bulk. I then adhered the rest of the panel to the card base using foam tape. I stamped the images from Cactus Hugs Stamp Set using alcohol marker friendly black ink and coloured them using copic markers. I die cut out all the images using coordinating dies. I adhered all images to the card. Stamped and embossed the sentiment onto black stripe and adhered it as well. To finish, I added some pretty crystals from the Cupid’s Kiss Crystals. Hope you enjoyed my card. Happy crafting! Hi crafty friends, I’m so exited to sharing with you my second card and tag that I created for Studio Katia new release. My card featuring CACTUS HUG STAMP SET , CACTUS HUGS COORDINATING and grid stencil. To make this card I took an A2 panel of Bristol smooth cardstock using the rounded corners cover die from DOTTED PATTERNS SET 3 | CREATIVE DIE. The background was created by blended shaded lilac distress oxide ink using grid stencil. Next I colored the sweet cactus using copic markers. I glued them to my panel with foam tape for dimension. Next I stamped a greeting from the CACTUS HUG STAMP SET using black ink. To finish off, I added some crystals from JUNE | CRYSTALS for decoration using STUDIO KATIA GLUE. Next I created the tag, featuring CACTUS HUG STAMP SET and CACTUS HUGS COORDINATING . To make this tag I cut from white cardstock a tag from the set DOOTTED PATTERNS SET 3 – CREATIVE DIE. The background was created by blended shaded lilac distress oxide ink. Next I colored the sweet cactus using copic markers. I glued them to my tag with foam tape for dimension. I hope you enjoy the card and the tag I created and feel inspired to create! Hey there! It’s Natalia here. Today I want to share with you my card with UNDER THE SEA stamp set. First of all I took Under the Sea and Shell-ebration sets and colored them with alcohol markers. Cut everything out on Big Shot using coordinating dies. I blended some distress inks onto 2 white pieces of paper . One of the panels I inked using BRUSH STROKE WAVES CREATIVE STENCIL and Distress. To create sandy bottom I inked one more piece of white paper and die cutting with TRIMMINGS BORDERS CREATIVE DIES. Placed all the elements on the white paper panel using double-sided foam tape. Heat embossed the sentiment from birthday greetings stamp set using white powder. Decorated everything with Clear Drops Mix One. It’s Kaja from Kajcyika crafts and today I have prepared a floral birthday card for which I used things from the new release! I had some hard time deciding which stamp set to use first, but then I went with a big floral image from the Aloha set. I used watercolor paper, so I could color the image in using Zig watercolor markers. I tried to use tropical colors and that’s why I colored in the flowers in pink and yellow. Once everything was colored I used coordinating die to die cut it out. I wanted to have an interesing background so I used two colors of blue distress inks and ink blended them on the bottom left part of the paper. To add some more details I used the new Grid stencil and ink blended the same two colors over the top. This gives a nice touch to the background without making it too distracting. In the end I felt like I added a bit too much of blue, so I sprinkled some white paint over it. This makes the white and blue more connected. The last think I added to the card was the sentiment which reads ‘Happy birhtday’ from the Cactus hugs stamp set. I heat embossed it on black cardstock using white powder. Then, I glued everything together using Studio Katia liquid glue and some foam squares. Hi there everyone! 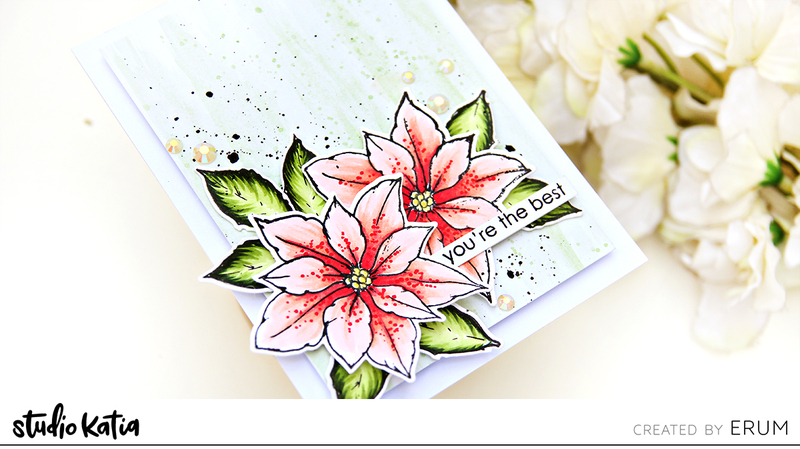 Erum here today and I will be sharing two cards with you featuring Merry Poinsettia Stamp Set. I actually didn’t plan on making two cards. But I stamped three of the single Poinsettias in the Merry Poinsettia Stamp Set and a lot of leaves. I coloured this while catching up on some tv shows. By the time I was done, I was left with enough images to make two cards. So I started by colouring the images with Artist Markers and then used the coordinating dies to die cut them. Next, I worked on the background. For that, I added a light colourwash of green watercolour and tried to get a dry-brush watercolour look. I adhered all the images with foam tape and added my sentiment. To finish, I adhered a few April Crystals. I followed the same steps to create the second card but kept this a little bit more clean and simple. 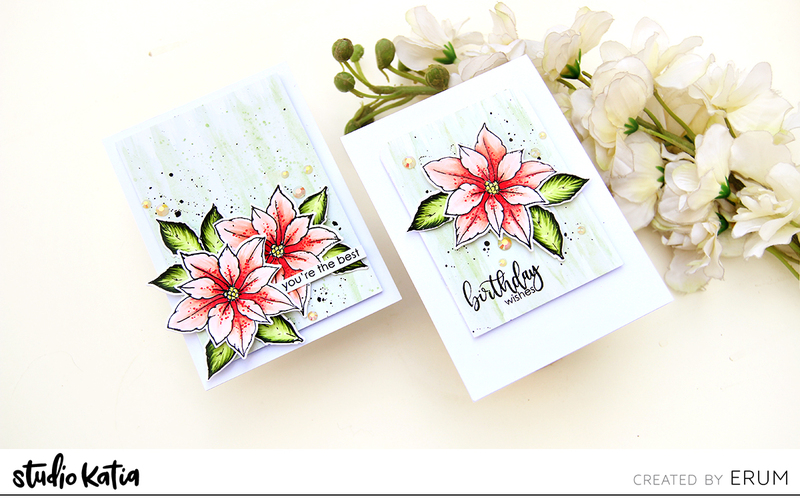 The sentiments on both the cards are from the Blooming Bunch Stamp Set. Ilda here with you today sharing a couple of crafty themed birthdays cards with you. One more complicated than the other but both easily made if you wanted to mass produce them to have on hand for your crafty friends Birthdays. To begin both the cards I started off by placing stamps from the Kobi Loves School evenly spaced onto the top half of an A2 card panel. Using a stamping tool I picked up the stamps, inked them up and stamped the images out onto the top part of the card panel and then flipped the panel around and stamped onto the bottom part of the panel to create the reverse images. The two middle images were stamped out after to fill in the space. As you can see I then just finished off the one layer card by stamping the sentiment from the Birthday Greeting set in the center space that was left and then just added the dotted edge to the panel using the largest frame from the Darling Ribbon and Frames Dies. This next card was done pretty much the same way as the first one only this time I adjusted the images to fit within the opening of the Loops Creative die and used fewer images. Also this time I stamped the sentiment onto black card stock and then used the small frame from the Dotted Patterns 2 to die cut the dotted edge around the sentiment. All the images were colored in using Copic Markers and then some were finished by using glossy accents. For an extra pop of color, I added a variety of crystals to both cards (see links below for the crystals used). Hope these cards inspired you today and maybe gave you ideas for easily creating cards that you may want to mass produce. Thank you for stopping by. Until next time… Happy Crafting!